Cut the potatoes in half and hollow out the flesh from the skin with a spoon. Do this carefully and be sure to leave about a 1/4″ rim of flesh still in the skins, or the skins will collapse/tear and won’t be strong enough to hold the filling. With a fork, mash together the potato flesh, 1/2 C of the cheese, salt, pepper and sour cream. It might seem a little dry, but it softens up in the oven, trust me. Split the mixture into four equal portions and carefully fill the shells with it. Top each with the reserved 1/4 C of cheese. Set the refilled potato skins on a baking sheet sprayed with cooking spray, equal distance apart. 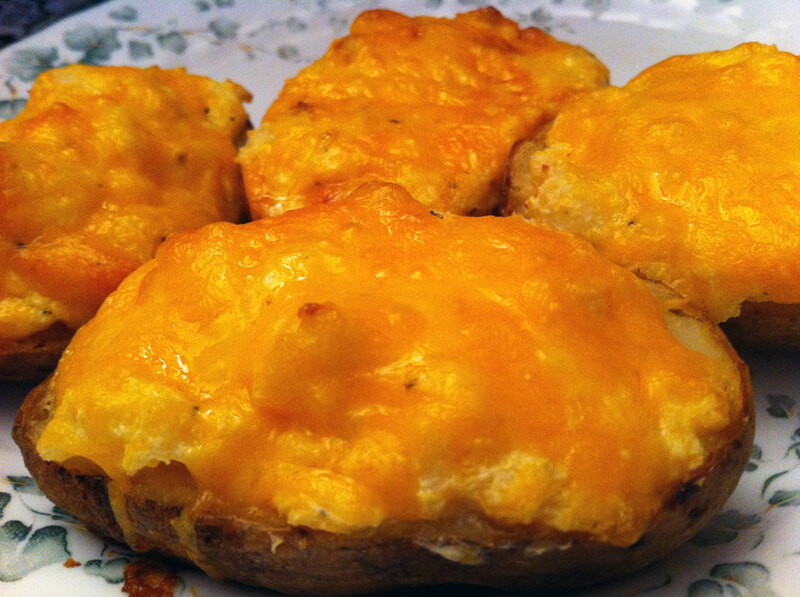 Bake for 15-18 minutes, or until the cheese on top is just starting to get a little bit browned on the edges. Allow to cool for a few minutes before serving as the insides will be molten! This entry was posted in comfort food, dinner, leftovers, oven, recipe, sides and tagged cheddar, cheese, pepper, potatoes, salt, sour cream. Bookmark the permalink.